Those Teddy Bear Puppies Are Just Too Cute! At the very first glance, you may see a sleeping teddy bear pup and think it’s an actual teddy bear, but it’s a puppy! The puppy that tricked your eyes is one of many new and popular breeds. 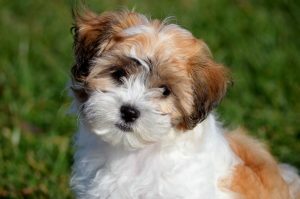 Their name is Zuchon, and they’re the precious blend of a Shih Tzu and Bichon Frise. There are several other names associated with this new designer breed. It doesn’t matter what you call them though, because each is as cuddly as the other! Are you considering purchasing a teddy bear puppy from our store? Continue reading to learn more. Don’t you worry too much about training a teddy bear puppy because they won’t give you much trouble. They are intelligent and eager to please. They are treat motivated, so use them to your advantage when training your pup. You’ll get the desired results! Trust us. Teddy bear puppies haven’t been around and available for very long. It’s said that they were first discovered and introduced in 2000. There are talks that it was sooner, but 2000 is a documented date. Since then, they have certainly and steadily gained popularity in the hearts and homes of many dog owners across the country. You can expect that the teddy bear will grow to weigh between 5 and 15 pounds. They are small dogs, so they will only stand approximately 6 to 12 inches tall. Though they have a relatively short history, they have a long lifespan ranging from 15 and 18 years old! These pups are active and playful and fun! Engage them in any sort of game, and it will serve as an exercise to meet their daily requirement. Feel free to take them on walks for socialization and environmental stimulation. It’s been reported that teddy bear dogs are somewhat intuitive and will conform to your energy level. If you want to go for a long walk outdoors or relax on the couch, they’re game either way! As we previously mentioned, they are rather intelligent. These fluff balls are friendly and will suit well in just about any home. It doesn’t matter if it’s an apartment or larger house. They are adaptable and well-mannered dogs. They aren’t very vocal, so you needn’t worry about excessive barking. They will alert you when the doorbell rings, or there’s a knock, but that’s about it. Teddy bear puppies are a dream, and we have them right here at Furry Babies! Feel free to contact us for more information on how you can have one or more!